Well I added more thing to this wall cause it was deleted when I put the original up so here yall go. After the most recent comment I went and looked for the original psd file of this and low and behold I had it. So I updated and fixed a few things. 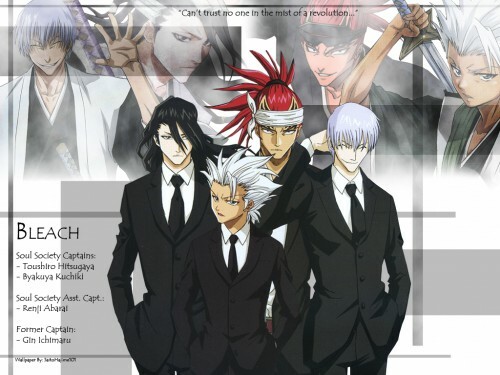 For those who still have the original, youll notice some changes like Renji and Byakuya in suits have been switched and height issue was addressed and fixed, except for Hitsugaya. After fiddling around with the scan of Hitsugaya and trying a few things I could not get his height to be right without the size of his complexion being totally off with the rest of the stock images which would cause inconsistencies. So the only explanation I can offer is that Hitsugaya is standing on a stool for this picture (ahahahaha). Anyhow I also fixed the Renji and Byakuya fades in the background, there was some cutting issues and some spots were noticable that I missed cut places. Last couple fixes included the updated info concerning Gin Ichimaru since he's no longer a Soul Society Captain (hasn't been for a long time now), and I added an extra bar to the image. Overall with this wallpaper I tried to stay extremely simple as I am a simple artists. So I know its not a background alot of people will think is great, but an issue i have is when people make these great backgrounds that aren't the focus of the wallpaper. For this I wanted the focus on the stock images, not a background (since the background would have little bearing on the concept). So there you have it. I THINK IT LOOKS WERID! All taichos but only Renji is fukutaicho... Nevermind, the wall still nice. :D Good wallpaper for the fans of this group. :) I like it, and my friend, who only loves this characters will love it. :D Perfect choice in cordinating colors. Clean and good design. :) They look so cool. great wallpaper! I like the 4 of them in black suits ... the background is also delicately done. I love it! Great job! Please keep up the good work! :) Thanks for sharing with us! they're hotty don't u agree ? of the 4 guys in their shinigami uniforms! i really like the background ! But isn't he a bit too tall? O.o. I wasn't so sure on the height of these characters. All I knew was the Toushirou was the smallest and Byakuya was the tallest, so I sized them as I saw fit. OMG THEY ARE SO HOT IN SUITS! Yup! I agree Hitsugaya a bit too tall. And if I not wrong the tallest is Renji not Byakuya. Renji was 188 cm and Byakuya was 180 cm, I read it at Bleach character file. But actually who cares about the height since this wallie is so COOL! Thx! Thank you so much for sharing this beautiful picture.